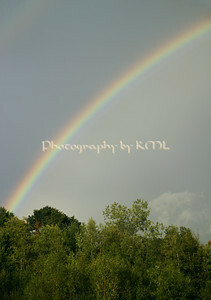 In a previous post, I had mentioned there was another viewer admiring the rainbow as we were during a summer storm. He is hard to see - my lens would only zoom in so close, and one reader, Kay in Alberta, mentioned she thought she could see a bird on the right. She is correct - a crow was sitting at the very top of a tree in the pouring rain. He seemed to be admiring the view - I wonder what was running through his mind - if they saw things the same way we do. He must have enjoyed it though because it was raining really hard, and he was the only one we could see that was getting soaked. 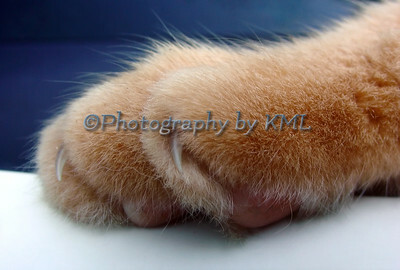 Thank you all for stopping by and commenting on my previous posts - it is appreciated! Ornithology is the science of birds. And I am in need of the knowledge from an ornithologist, or someone who studies birds. This duck appeared at the lake about two weeks ago. It is always in the same area by the boat ramp. My first question is: what kind of duck is it - wild or domestic? I am concerned that if it is domestic, we are going to have to find someone to come and get it so it can have a home. If it is wild, shouldn't it be part of a flock heading south for the winter? I have seen this bird on the side of the road picking in the gravel - it has come close to getting hit by a car several times. Hopefully I am worried about it for nothing, and one of my readers can let me know about it. 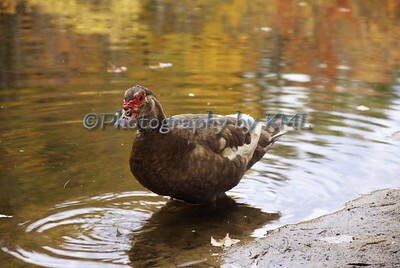 So if anyone has any idea about this kind of duck, please let me know. And I thank you in advance for sharing it with me. As promised in the last post - here is the shot of the whole rainbow. And if you look closely, you will see the second one that is much lighter just over the top of the bright one. Now, this is not a quality image that can be used for sales because of the darkened corners. I usually just crop the images that have them so they are no longer showing, but to do that to this image would cut off the rainbow on the sides. I sometimes "fix" it in photoshop, but there is too much needed in this image to make it all blend smoothly. 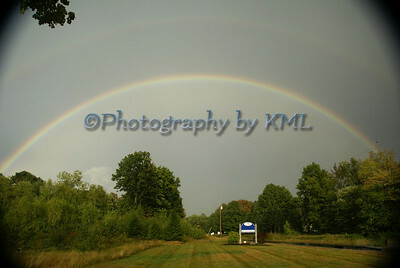 I am just glad my lens has a large enough wide angle so I could get the whole rainbow in. We were the only ones who stopped to enjoy this treat, but there was another viewer. I knew it would be there somewhere in the sky. It was pouring right where we were, but the sun was shining directly in our eyes as we headed home in the car. I kept looking behind us - I know that was where it would be in order for the sun to shine through the drops and make the rainbow. But the trees were all around us, so I couldn't find it anywhere. Then we crested the hill about two miles from our home. It is an intersection that has a corner store, so the area is cleared of trees. 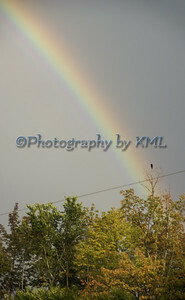 I looked back, and the whole rainbow was arching across the sky. Actually it was a double rainbow with a faint one just over the top of the bright one. My husband pulled into the parking lot of the store, and since it was pouring, I was able to sit in the car and take the photo through the open window. What a treat - being in the right place at the right time! Next time I will post the whole view - stay tuned! 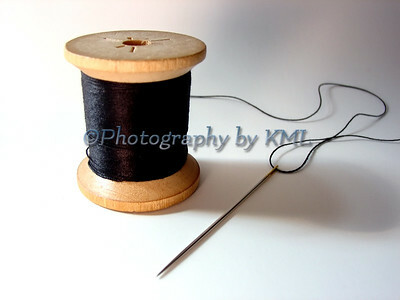 I can remember when I was younger, my grandmother always had me thread her sewing needles for her. She had a really hard time seeing the hole that the thread went through. I always loved helping her, thinking - this is really an easy job. Fast forward 40 years, and now I am the grandmother. Gram was right - those holes are pretty much non-existent and it takes me forever to get a needle threaded these days. But with the help of a magnifying glass, it does get done, as does the job it is needed for. This image doesn't do the fall colors justice - they are so bright this year. 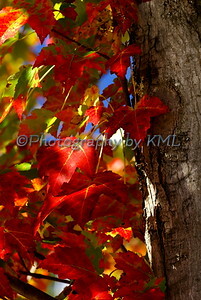 It is now peak foliage season in our area and the leaves that survived last weekend's wind storm are just gorgeous. I'm sure the song is referring to the majestic Rocky Mountains, but the rolling ones we have here in New England are beautiful too. This is a Sponsored post written by me on behalf of pmg123. All opinions are 100% mine. Ansel Adams, a master of photography, created this image in 1942. Most of the tweaking of his photos was done in the darkroom, unlike today's digital world where we do the tweaking on our computers. We may think we know more today, but view any of his work and we are certainly put right back in our places. I have always admired his work and any time I can get my hands on a book with his work in it, I devour each page. I have never had the chance to see his actual photographs in a museum or gallery, but I hope to someday. The Phoenix Art Museum is the place to be right now if you are lucky enough to be in that area. They currently have a program set up of world-renowned collections that include the works of 2000 photographers and over 80,000 images. Just to throw around a few names, Ansel Adams, Edward Weston, and Loiuse Dahl-Wolfe. These are just a few of the photography masters who's images are included in the museum's exhibition. For now, I will just have to enjoy the small collection of photographs that they have posted online. I envy the viewers who get to enjoy these artist's works in person - what a treat for the eyes! 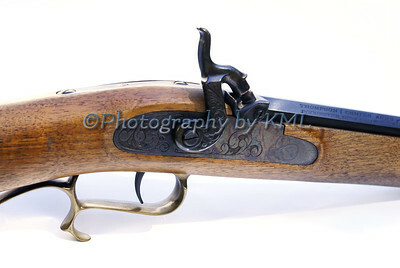 Just look at the fancy work on this old muzzle loader. I would never dare fire this old weapon - way too much kick back for me. My boys both use new, modern day muzzle loaders, which are fine looking pieces also. But the old ones always catch my eye. The delicate details on them sometimes are quite amazing considering their jobs. And that hammer with it's graceful curves doesn't look like it belongs on a gun. The wood on this one isn't too fancy, but on some of these weapons the stocks are really works of art too. 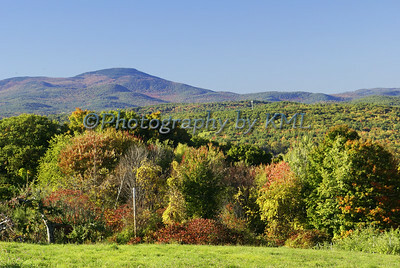 The hills and valleys are ablaze with color here in New England. Each time I go out to catch the leaves in all their glory - the clouds move in. And without the bright sun they just don't seem to have that glorious glow. We hiked over two miles today at the dam, and the clouds really know how to time things. I captured some images, but nothing as grand as this one taken a couple of years ago. While there are still leaves on the trees, I will try my best to capture them. This may not be the year for my camera to photo them, but the eyes are sure enjoying a feast! 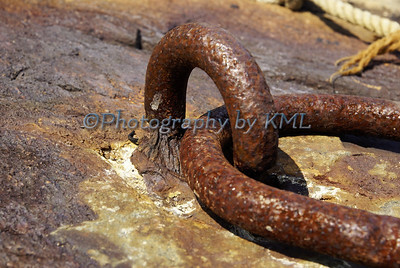 An old loop and link just sticking right out of a rock beside the ocean. Rugged and rusty, it has been there a long time. A small length of ratty old rope - perhaps a foot long, was tied to the loose link. I really don' t understand how they pound those metal loops into those hard rocks - and they stay in there. Not sure it it is used anymore for anything, but it can sure trip up an unwary walker - glad we all kept our eyes open that day. We have an update on the kitty that I posted about in my last post. The little newcomer would let us get just close enough to pat the top of her head but nothing more. If we bent down at all, she was off in a flash. What probably didn't help was that any time we were paying any kind of attention to her, Rusty would be right by our side - wanting the attention too. Keep in mind that he is a very independent feral cat - around at meal time and gone the rest of the time. We never saw so much of him as when the kitty was here. But he was pretty patient with her considering she was his competition. My son came home one evening around 10 pm, and there was the kitty on the steps. She didn't run away or protest at all when he bent to read her tag with his flashlight. It had the name "Boots" with a phone number under it engraved on the front. We called the number and the neighbors, about a 1/3 of a mile down the road said she had been missing for about a week. She was only 4 months old, and they said they thought she was a he, but they weren't sure. Figured they would know once they got her fixed. I am thinking she must have wandered off and got lost. Glad she was reunited with her family!